The Man from Earth is a rare stage play that raises challenging intellectual questions usually only seen in the best science-fiction, reminiscent of Twilight Zone and Star Trek. This is no coincidence, as it is the final dramatic work by playwright Jerome Bixby who was responsible for several episodes of both series in the 1950s and 1960s. His Twilight Zone episode “It’s a Good Life,” about a 3-year-old who commands vast supernatural powers and terrifies the residents of his town, is widely considered among the best of the legendary series. His Star Trek episodes include “Mirror, Mirror,” where the crew are interchanged with their evil counterparts from a parallel universe; “Day of the Dove,” where an alien entity thrives off violent energy from conflict it engineers; and “Requiem for Methuselah” about a man who has lived for thousands of years. He also co-authored the short story that provided the idea for the film Fantastic Voyage that was subsequently “novelized” under contract by Isaac Asimov (leading to the common but mistaken impression that Asimov was the original author). It is “Requiem for Methuselah” that inspired The Man From Earth, which was made into a well-regarded although obscure film in 2007. Both the film and stage versions of the story take place entirely at the home of history professor “John Oldman” (Ed Benjamin, III) who has abruptly resigned from a tenured position after 10 years at a small college (jokingly referred to as “We Teach U”) in the American Southwest, explaining only that he has “cabin fever” and “itchy feet” that make him want to move on. His colleagues surprise him at his house to give him a proper good-bye party: anthropology professor “Dan” (Bruce Church), biology professor “Harry” (Chris Sabatino), art history professor “Edith” (Elizabeth Parent) and John’s office assistant “Sandy” (Megan Ruggiero). Archæology professor “Art” (Dave Almeida) arrives on a motorcycle with student “Linda” (Emily Lamarre) and gives John a copy of his new book, Shadows of the Cave: Parallels to Early Man. Not only has John abruptly resigned, but a moving crew (Bob Messier) is picking up for donation all of his furniture and possessions that he cannot fit into his pickup truck. Art historian Edith sees what looks suspiciously like a previously unknown original painting by Vincent van Gogh. As his friends express concern and press John about the reason for his sudden departure, he decides to tell them his secret: He is 14,000 years old and moves on every 10 years when people start to notice that he doesn’t age, appearing permanently about 35. He presents this information initially as a hypothetical, asking whether they believe such a thing is possible, and the impromptu panel of interdisciplinary experts conclude after discussion that it is not impossible. Biologist Harry lays out the physiological aspect: if someone had a “perfect” immune system good enough to prevent decay and aging so that the usual process of cellular replication and regeneration never went awry, then in principle an individual could live indefinitely. Anthropologist Dan realizes that such a man would be very confused at first, unable to understand any more than is understood by the culture around him, constantly reinterpreting his memories and experiences in terms of the accumulating scientific and other knowledge of the society. John infers that he was a part of the culture archæologists now call the Magdalenian Upper Paleolithic that ranged across Europe and the Near East before the end of the last ice age, the toolmaking culture responsible for the most well known of surviving cave paintings. (“Upper” simply means recent, derived from geological references to excavation layers. “Paleo” and “lithic” mean “old” and “stone,” respectively, so the “Paleolithic Age” means “Old Stone Age.”) John says that he has a memory of seeing the British Isles from France across the English Channel, empty then because the waters that today flow into it were blocked by ice dams. He says that in his long lifetime he was a student of the Buddha and a few hundred years later tried to bring those teachings to the Jews of the Roman Empire. He says the painting was given to him by van Gogh personally. Art becomes convinced that John is having a psychotic break, and he quietly telephones another colleague, psychiatry professor “Gruber” (Robert Ellis Smith), who quickly arrives to assess the patient. As things develop, a police officer (John Burke) is called. Bixby is very careful to get the details correct, at least insofar as was possible with the science as it was understood before his death in 1998. Unlike many such attempts at speculative fiction, someone knowledgeable about many of the subjects touched upon will not be angered by dumb mistakes. The anthropological consensus a few decades ago was that anatomically modern humans, the subspecies Homo sapiens sapiens, emerged around 200,000 years ago, and at some point around 70,000 years ago, possibly in response to a severe ecological crisis, began expanding out of Africa into the rest of the world, reaching much of what would become the inhabited world by about 25,000 years ago. By contrast, behaviorally modern humans – defined as capable of planning ahead, managing a hearth and fire, knowing how to fish, burying their dead, and making art – seem to have emerged only about 50,000 years ago. Why there seems to have been a gap of nearly 150,000 years between when humans could have become behaviorally modern and when they did is a great mystery in anthropology, explained by hypotheses ranging from lousy evidence (eventually artifacts will be found showing behavioral modernity much earlier) to environmental provocation (everything was going fine until humans were forced to acquire skills to leave Africa to survive). Since Bixby’s death, discoveries including new anthropological sites and better techniques for retrospective genetic analysis have complicated this neat timeline, but his choice to have his main character born 14,000 years ago has held up. After forcing a nomadic existence hunting and gathering, about 12,000 years ago the last ice age gave way to a warming climate that allowed the invention of agriculture along with the beginnings of civilization needed to support it, including social organization and hierarchy, preservation of information across generations through writing, simple machines such as the wheel, enough mathematics to survey land and conduct trade, and astronomy sufficient to manage crop planting. By about 8,000 years ago someone figured out how to fire clay in kilns to make pottery. By about 5,000 years ago someone figured out how to greatly strengthen copper by alloying it to make bronze. By about 4,500 years ago the Egyptians could build pyramids. By about 4,000 years ago the Babylonians needed to make legal codes. By about 3,000 years ago someone figured out how to smelt iron. The rest, quite literally, is history. Various strands of the story are drawn from the zeitgeist of the 1960s: The discussion about Christian Gospels that seems a terrifying heresy to Edith, a devout believer, is drawn in significant part from the highly polarizing non-fiction 1965 bestseller The Passover Plot that became well enough known to inspire its own film version in 1976 and remained in print into the 1990s, and it seems impossible that Bixby was unaware of it when writing this play. There are many subtle references, even jokes, about time. At one point John plays a recording of Beethoven’s 7th Symphony, which is an atypical piece that, unlike any other work by the composer, derives its structure almost entirely from rhythm and tempo – and it is famously the first work in which Beethoven annotated the tempo in explicitly numerical beats-per-minute using the newly invented metronome rather than just the less precise traditional Italian designations (“vivace,” “allegretto,” “presto,” and “allegro”). Art sarcastically suggests that instead he should have played Stravinsky’s Le Sacre du printemps (The Rite of Spring), perhaps the only widely performed work that depends even more on rhythm and tempo to an extent that provoked riots in the audience at its premiere. The set design is innovative with two separate platforms, one for the parlor of John’s rustic cabin with a stone fireplace and the other a Southwestern vista for his pickup truck as it is loaded with boxes. The house left half of the audience has a much easier view without having to crane their necks, something of a deficiency in the layout for the other half. There are a number of clever “Easter eggs” on stage for Star Trek fans: if you think you see one, you’ll probably be correct. Benjamin wore a David Bowie T-shirt, slyly playing on the confusion of The Man from Earth with the similarly named but totally unrelated The Man Who Fell to Earth. Among a uniformly excellent cast in a captivating production, Benjamin is very convincing as “John” as he reluctantly unspools a seemingly fantastic tale in a way that ebbs and flows in the credulity his academic colleagues are willing to accord it. Almeida as “Art” is the most extreme skeptic, a supremely confident archæologist, leather-clad and riding in on his motorcycle, regarding John’s story as so absurd that the only possible explanation for it is psychosis, although it is Lamarre as “Linda,” arriving on the back of the same motorcycle, who is most open to the possibility that John’s story is true, innocently observing of a 14,000-year life, “What a chance to learn.” Church as anthropologist “Dan” and Sabatino as biologist “Harry” become something of a team, expertly playing off each other as they slowly begin to accept that John’s story just might possibly be true. Parent as art historian “Edith,” however, is emotionally shaken into a frenzy by the philosophical and religious implications of John’s story, viscerally unraveling as her colleagues start to take him increasingly seriously. Ultimately, though, it is Ruggiero as office assistant “Sandy” who has fallen in love with John and Smith as the ever more forceful psychiatrist “Gruber” who must take the lead in determining the course of events, the former willing to accept John’s story on faith and the latter, in a superb performance, unwilling to consider any possibility other than mental illness. Co-directors Alex Aponte and Douglas Greene wisely chose to present the play in a single act, allowing the audience to be drawn into the twilight zone of doubt, as even the characters observe that there is no way to either verify or falsify John’s claim to be 14,000 years old. Scientists must be familiar with such doubt, always open to the possibility that evidence may be discovered that challenges their assumptions, even their most fundamental ones. 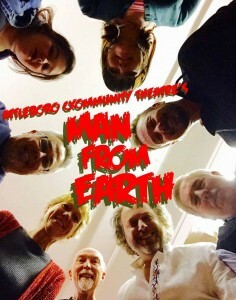 If you loved The Twilight Zone, “a dimension not only of sight and sound but of mind,” this Attleboro Community Theatre production of The Man from Earth has everything you could want except for Rod Serling.